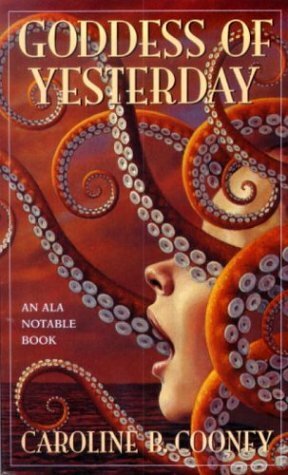 I received my hardback copy of the Goddess of Yesterday during a summer reading program at my local library in 2004. To get our free book from the book cart, we had to read for five hours and turn our coupons in. I read five hours the first day of the summer program and pitched a fit when my mom wouldn’t take us back to the library the next day. I chose this book from the book cart solely for its cover. I’ve been attracted to fantasy novels from a young age, and without reading the inside cover, I assumed this was a book about Medusa. I was wrong, as it is definitely more historical fiction, but I loved this book just the same. I’ve read it several times since choosing it from that cart, but lost it in a move several years ago. Goddess of Yesterday is about Anaxandra, who is kidnapped by a king at a young age to be a companion to his young, crippled daughter. She adjusts to life in their culture, until it is sacked by pirates—and she’s the only one who escapes. She assumes the identity of the king’s crippled daughter, Princess Callisto, to survive, and is taken in by the King of Sparta. Helen, his wife, and Paris, her mister, do not believe she is Princess Callisto, and Anaxandra must stay out of the way of spoiled, witchy Helen of Troy to survive. To this day, I still love the main character. She is extremely resourceful, strong, independent, and likable. She doesn’t need a man to save her, and she saves herself. She is complex and I found myself feeling for her—terrified, relieved, terrified again. Cooney does a fabulous job at shaping her other characters, too, and I also found myself hating Helen of Troy, who is extremely spoiled and terrible. The story moves along quickly and wraps up well.